Have you ever wanted to know what you need and how to foil print? 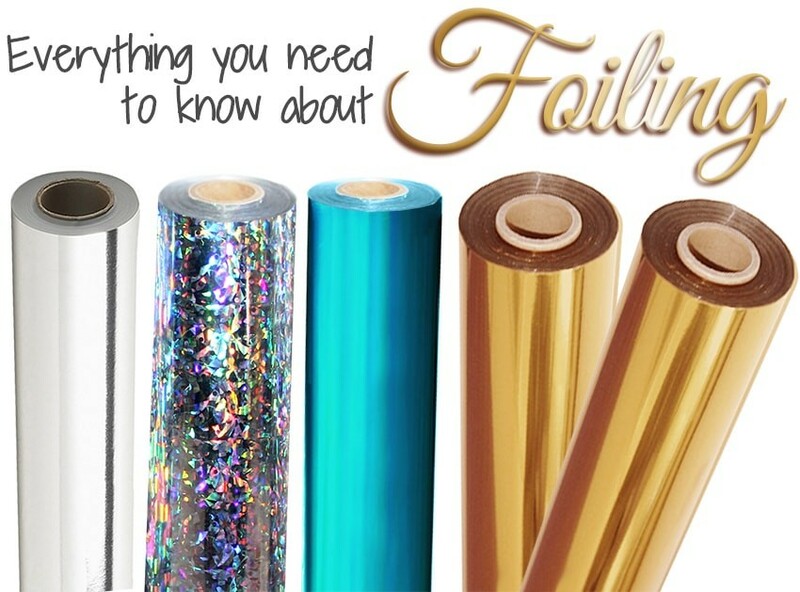 In this comprehensive guide, I will walk you through everything you need to know about foiling. Bookmark it and use it for reference, or share it with your friends on social media so everyone can shimmer and shine with their own foils. Foil printing can help to give your standard toner-printed sheets an elegant and professional look that isn’t available through standard printing techniques. Easily hot foil business cards, invitations, certificates, awards, greeting cards and more with foil fusing. With multiple foiling methods, you can create custom foiled documents for personal, or high production use. On the back of our toner foil rolls is a specially formulated adhesive that is activated with heat. This adhesive has properties that allow it to stick to dry toner that is printed on smooth paper stock. This is what makes it stick to your printed design, without sticking to the paper as well. It is important to note that it will only stick to dry toner, which is most commonly used in copiers or laser printers; it won't work with Inkjet prints. So if you are doing this at home and your printer is an Inkjet, check with your local print shop about printing your designs - they likely have the proper equipment to do so. Alright, let's move onto the how to, shall we? There are two different official ways to foil...with a foil fusing machine (for high volumes) or with a pouch laminator. Some customers also get creative and try it with irons, although I haven't had the opportunity to try that out yet to say how well it works. So let's go over how to foil with a fusing machine, and how to foil with a pouch laminating machine. You can also apply foil using a pouch laminator by cutting a piece of the foil off of the roll, placing the foil over the desired location, inserting the paper and foil into a laminating pouch carrier and the running it through the pouch laminator. Applying foil in this manner applies brilliant metallic color foil to black and white toner copied or printed documents. Applying foil to your special documents can now easily be done at home or in the office. Foil can be adhered to applications by using specific models of pouch laminators. Binding101.com offers a variety of pouch laminators ranging from 4" up to 13" wide. For foiling at home or in the office, use the instructions below to help you get started. • A pouch laminator with variable heat and speed settings. Must be able to reach a temperature range of 250°-300° F & be able to handle 10 Mil Pouches. ① Warm up your laminator. The temperature for foil fusing will need to be quite high (usually between 250°-300° F). It is a good idea to have enough material to do test runs and adjust the settings until you get the perfect foil, since it can vary a bit depending on the kind of paper you use, the laminator itself, and the foil type. ② While your laminator is warming up to the appropriate temperature, prepare your document for foiling. ⓐ Print your document for foiling using a copier or laser printer. ⓑ Cut a piece of foil off the roll in the appropriate length and width. ⓒPlace the piece of foil over the printed area where you want to add foil and carefully put the item into a laminating pouch carrier. If the foil moves at this point the foiling process will not be successful so you will need to be careful. ③ Now that you laminator is warmed up to the correct temperature you will want to take your pouch carrier with the document and foil in it, and feed it through the laminator. The heat from the pouch laminator will cause the foil to bond to the toner on your sheet and the foil will be transferred. ④ Once the document comes out of the other side of your laminator, you will need to remove the excess foil and allow the document to cool. A foil fuser applies toner foil with a heated roller that is similar to the way a roll laminator applies laminating film. However, the foil only sticks to where there is dry toner. Using a Foil Fuser Machine to transfer metallic foil to documents makes the process more automated. Foil Fusers allow the user to use full rolls of foil instead of feeding individual cut sheets. If large jobs are in the schedule, Foil Fusers will greatly reduce the cost of foil and labor. They are easy to use & require no special training. They allow inexperienced operators to produce expert-looking projects in just minutes. I won't be able to list specific instructions for how to foil with a fuser, because each machine will have specific step-by-step instructions that vary. So, take a look at the foil fusing machines we have, and you will see directions for the different models. There are a TON of foil colors you can use, including holographic patterns, glitter, and so much more! Add brilliance to your documents with toner adhesion foiling! Special toner adhesion foil is available in a wide variety of colors & designs. The adhesive on the foil only sticks to the dry toner used in most black and white copiers and laser printers, so you can add foil to select portions of your document, or to the entire thing. The foiling application is very popular for wedding or other invitations, award certificates, creating borders for craft projects, adding pizzazz to business cards or letter head, and anything else which would benefit from bright metallic color. And before I go, here is one last video clip of what I did with the foil scraps leftover from some foil projects. Save your foil scrap leftovers to make fun designs like this!